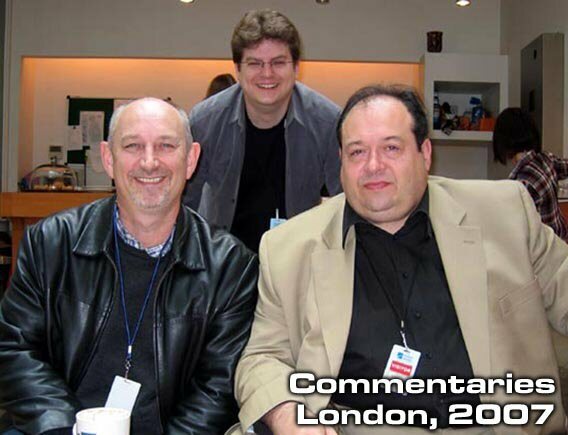 Join us, fans, for a rare and special moment: Rob Grant and Doug Naylor recording their brand new DVD commentaries - frank, honest, on-the-record, and only on The Bodysnatcher Collection. These commentaries were recorded on May 16th at Trident Studios - a facility with a rich history. Trident have seen the likes of The Beatles, Elton John, Queen, David Bowie and Genesis recording there. So maybe it's appropriate that we've also made a little bit of Red Dwarf history within their booths. After a few small headphone-related issues - "They're not plugged in - is that important?" - the guys began recording with The End: The Original Assembly. The commentary brilliantly covers both the reasons for reshooting Red Dwarf's opening episode and other, more general, Series I -related stuff. As you may know, it was the availability of a seventh episode filming slot that allowed The End to be so heavily remade. "How did we get away with only delivering six episodes?" asks Doug. "Maybe they saw the show," Rob replies. Oh, and listen for their reaction to Craig's first-version delivery of the word 'stasis' (with a hard A, as in 'plastic'). Funny, engaging and informative, Rob and Doug fell into old rhythms with ease as they moved on to Bodysnatcher, the central feature of a packed collection, and - more importantly - the script they began in 1986 and completed in 2007. Impressed by the storyboards (more on these another time), Rob couldn't help but comment. "These are some nice camera angles - Ed are you watching?" In fact there's a touch of regret to this discussion. Both writers clearly feel that Bodysnatcher, as a script, is actually significantly better than Series I episodes like Waiting for God and Balance of Power, and wonder aloud how it didn't get made... until now. It's also revealed that, to the best of their recollection, Bodysnatcher was never completed when originally written. Despite intending it as episode two before the infamous strike halted production, the hope was that, like Queeg, the conclusion would eventually present itself. Which it did - when they finished the script this year. Still, with one lost script commentary in the bag, why stop there? Which is why we also had the guys provide their musings on the lost script extracts - Dad, Lister's Father, Infinity Patrol and Rimmer's Dummy. And that was that. The boys went off for a curry, the sound files were saved ready for mix down, and we left the historic venue chuffed to bits to have witnessed a remarkable Red Dwarf moment. It should be noted, in fact, that all this commentary-ing will create, in total, three versions of Bodysnatcher available on the DVD. The storyboard version runs at around 36 minutes and, since its recording, has been edited much like a regular episode of the show - ensuring proper pacing and omitting little sections that didn't work or that held up the thrust of the story. Version two, meanwhile, is a full audio edition. Running at a whopping 44 minutes, this is Chris Barrie's full script read - with every detail retained (including the scripted descriptions of skutters and Lister's Mugs Murphy T-shirt), and all the sound effects in place. Think of it as 'the original assembly' if you like, as it's quite an insight into the process. The post-edit version fixes certain dramatic problems - one scene is cut entirely, another is moved forward, and the thrust of the story becomes clear a lot sooner - but the full audio edition is there for historical reasons. You get everything that was on the page. The third way to watch Bodysnatcher, of course, is with the Rob Grant and Doug Naylor commentary. Yes, a Rob Grant and Doug Naylor commentary. 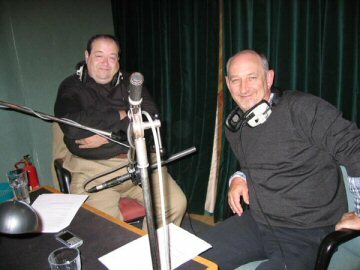 Did we also mention the Rob Grant and Doug Naylor commentary? Be prepared to laugh and learn. It's history in the making. Red Dwarf: The Bodysnatcher Collection will be out in the UK on October 22nd.